This section offers Site Information covering various aspects of the Monument, Reports about activities conducted within the Monument, and Management Documents related to the establishment and management of the Monument. Learn about the Papahānaumokuākea Marine National Monument, its coral reefs and unique features as well as its history and how it will be managed. This 28 page Citizen's Guide is an excellent introduction to the largest fully protected marine protected area on the planet. A revised plan describing the actions needed to recover the nation’s most endangered waterfowl species - the Laysan duck - was released today by the U.S. Fish and Wildlife Service. This revised recovery plan replaces the original recovery plan published in 1982. Excellent summary of the status of coral reefs in the NWHI as well as the rest of the U.S. and Pacific Freely Associated States. The link above will take you to a page where you can download the complete report or only those sections you are interested in. Please visit the web page on fishing regulations and the sanctuary designation process for more background on the documents above. 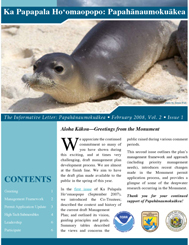 This second issue outlines the plan’s management framework and approach(including priority management needs), introduces recent changes made in the Monument permit application process, and provides a glimpse of some of the deepwater research occurring in the Monument. 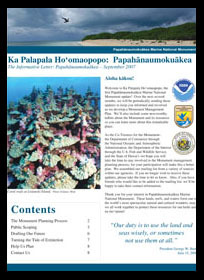 The Ka Palapala Ho‘omaopopo (The Informative Letter), is Papahānaumokuākea Marine National Monument's update bulletin! The bulletin is published periodically, with its main goal being to keep the public updated about the development of the Monument Management Plan. Articles about current research, as well as "Good News!" stories are also included. Related documentation–Scoping Report and Summary. This set of documents summarizes the issues raised during the three public comment periods relating to the management plans for the now Monument, which span a seven year period beginning in 2000. Of the nearly 52,000 comments collected, most supported strong protection for the Monument. Amending Proclamation 8031 of June 15, 2006, To Read, "Establishment of the Papahānaumokuākea Marine National Monument"
The parties to this agreement are the State of Hawai‘i–through the Department of Land and Natural Resources; The U.S. Department of the Interior–Through the U.S. Fish and Wildlife Service; and the U.S. Department of Commerce–Through the National Oceanic and Atmospheric Administration. The MOA sets forth the objectives and responsibilities necessary for coordinated management, and establishes the functional relationships that will allow for effective coordinated efforts. The preliminary draft management plan developed specifically for the proposed national marine sanctuary is now being provided to the public. This document is provided solely for information purposes, as it was never finalized. We are not seeking comments on this version of the plan. The public will be notified when there is a revised plan available for public comment. 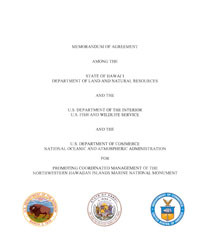 This document is th final operations plan for the Northwestern Hawaiian Islands (NWHI) Coral Reef Ecosystem Reserve (Reserve). This plan has been prepared by the National Oceanic and Atmospheric Administration, National Marine Sanctuary Program, and will serve as the primary management guide for the Reserve. Please note that there are 8 large (11" x 17") maps in the pdf document and in order to print the document correclty you will need to set the Page Scaling Option under the Print menu in Acrobat to "Shrink Large Pages"
This is Executive Order 13178, establishing the Northwestern Hawaiian Islands Coral Reef Ecosystem Reserve, as published in the Federal Register. This is Executive Order 13196, amending Executive Order 13178, as published in the Federal Register. This document incorporates amendments to Executive Order 13178 as described in Executive Order 13196. Overview of the Northwestern Hawaiian Islands Coral Reef Ecosystem Reserve Preservation Areas. This document provides a brief description of specific protection in each of the Reserve Preservation Areas. The following are individual documents providing detailed descriptions and maps of the Reserve Preservation Areas. Click on the island name below to download the document. Comment summary from the public visioning sessions held in July-August 2000. On December 4, 2000, Executive Order 13178 established the Northwestern Hawaiian Islands Coral Reef Ecosystem Reserve (Reserve). The Reserve encompasses marine waters and submerged lands of the Northwestern Hawaiian Islands extending approximately 1200 nautical miles long and 100 nautical miles wide. A 30 day comment period was held to receive comments on the Reserve and the Executive Order. During the30-day comment period, NOAA, on behalf of the Secretary of Commerce, received the public comments and held seven public hearings on behalf of the White House to accept written and oral comments. On January 18, 2001, the process and establishment of the Reserve was finalized by issuance of Executive Order 13196. This Executive Order modified Executive Order 13178 by revising certain conservation measures and making permanent the Reserve Preservation Areas with modifications. With this action, the establishment of the Reserve, including the conservation measures and permanent Reserve Preservation Areas, is complete. Click below to download a summary of changes made to Executive Order 13178. On May 26, 2000 the President announced his intention to provide "strong and lasting protection for the coral reef ecosystem of the Northwestern Hawaiian Islands." He directed the Secretaries of the Department of the Interior and Commerce, working cooperatively with the State of Hawaii and consulting with the Western Pacific Regional Fisheries Management Council, to develop recommendations within 90 days for a new, coordinated management regime to increase protection of the ecosystem and provide for sustainable use. The Departments were also directed to conduct "visioning" sessions, which would provide opportunities for public hearing comment to help shape the final recommendations. During July and August of 2000 seven public visioning sessions were conducted. Click below to download a copy of the comment summary from these sessions.